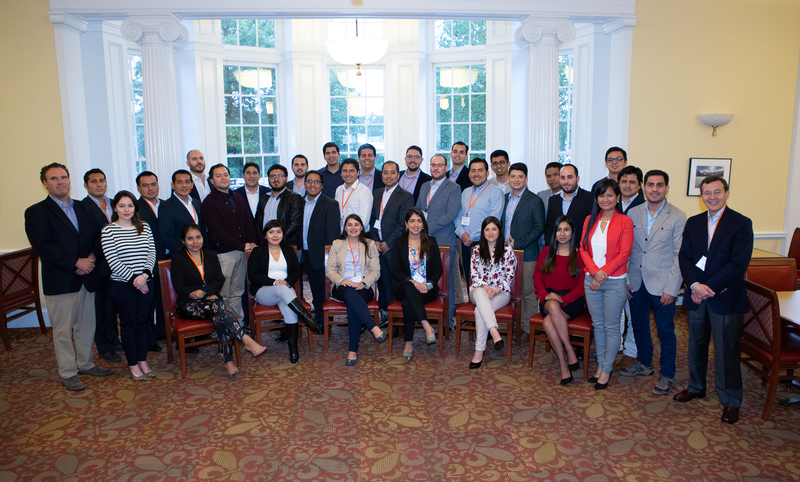 The Center for Global Initiatives hosted a cohort of 32 part-time MBA students from PAD School of Management in Lima, Peru from 8-12 October for an international partner program focused on innovation and entrepreneurship. The program, led by the Darden faculty team of Raul Chao, Tom Steenburgh and Elena Loutskina, included lessons in finance, operations, marketing and leadership applied through an entrepreneurial lens. During the program, students heard from Stephen Davis, president of local nonprofit Community Investment Collaborative, and Andrew Centofante, co-founder and head brewer of North American Sake Brewery, about their organizations and about Charlottesville’s entrepreneurial ecosystem. Later in the week, the PAD group visited UVA’s iLab where they met with entrepreneurs from the Young Leaders of the Americas Initiative (YLAI), a professional development program hosted by the Presidential Precinct and sponsored by the U.S. State Department. See below for more photos from the week!